The FAA has upgraded its Service Bulletin regarding some Aspen Avionics displays to a preliminary Airworthiness Directive that becomes final on February 7. Greatly summarized, the FAA says to disable ADS-B In on EFD1000 and EFD500 units, then update the Airplane Flight Manual Supplement (AFMS) to prove it. It estimates the total fix time at half an hour, mentions that Aspen is working on a permanent fix for the problem so its features can be turned back on, and in essence says to do this now. SAIB SW-18-31 was prompted by 14 reports of flight display units repeatedly resetting, uncommanded, in flight. This AD requires disabling the ADS-B In function in each installer menu by changing the RS-232 INPUT for the bus connected to the ADS-B In to NONE. This AD also requires revising the AFMS to reflect each disabled unit. Differences Between the AD and the Service Information: The service information specifies contacting an Aspen Avionics dealer to disable the ADS-B In function, whereas this AD requires contacting the FAA for approval of the procedure. Interim Action: We consider this AD interim action. The design approval holder is currently developing a modification that will address the unsafe condition identified in this AD. Once this modification is developed, approved, and available, we might consider additional rulemaking. The FAA believes around 2,000 aircraft may be affected. COO could not confirm it, but that is likely from Aspen sales data. Disable the Automatic Dependent Surveillance-Broadcast (ADS-B) In function in each unit by following the Procedure, paragraphs 5.2.a. and b., of Aspen Avionics Mandatory Service Bulletin No. SB2018-01, dated November 21, 2018 (SB2018-01); except, where SB2018-01 specifies contacting an Aspen Avionics dealer to disable the ADS-B In function, this AD requires disabling the ADS-B IN function using a method approved in accordance with paragraph (h) of this AD. Revise the Airplane Flight Manual Supplement in accordance with paragraph 5.2.c of SB2018-01. Note 1 to paragraph (g)(2) of this AD: The AFM for the aircraft affected by this AD is required to be furnished with the aircraft, per 14 CFR 23.1581. Further, operators of the aircraft affected by this AD must operate in accordance with the limitations specified in the AFM, per 14 CFR 91.9. This Special Airworthiness Information Bulletin (SAIB) informs registered owners/operators of an airworthiness concern for aircraft with an Aspen Avionics, Inc. (Aspen), Evolution EFD1000 Primary Flight Display (PFD), an EFD1000 Multi-Function Display (MFD), and/or an EFD500 MFD unit as installed by Supplementary Type Certificate (STC) No. SA10822SC. These units are installed in different configurations on, but not limited to, the aircraft makes and models listed in the attachment below. Specifically, this SAIB notifies owners and operators of temporary loss of all flight display information due to blanking during reset. In installations where multiple Aspen EFDs provide redundancy, this may result in loss of all altitude and airspeed reference during the reset period. We were recently notified that there have been numerous reports of Aspen EFD1000 PFD, EFD1000 MFD, EFD1000 EBD, and EFD500 MFD units with software version 2.9 and the ADS-B IN (FIS-B) Weather Interface option repeatedly resetting itself in-flight. The reset occurs between five- to ten-minute intervals. During the time of the reset, the pilot might not have any EFD displayed information including access to altitude and airspeed for up to one minute. The cause of this safety issue is currently under investigation; however, preliminary information suggests that the cause of the continuous reset is related to the ADS-B IN interface. Pulling the ADS-B circuit breaker as described in section 3.2.6 of the Flight Manual supplement, has been demonstrated to resolve the issue. 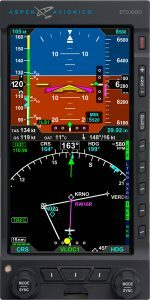 The FAA recommends that owners and operators flying with Aspen EFD1000 and/or EFD500 units with software version 2.9 and the ADS-B IN (FIS-B) Weather Interface option installed restrict flight to Visual Flight Rules only and suspend night operations to allow safe operation in the event of loss of flight display functionality. Alternatively, the FAA recommends disabling the ADS-B IN (FIS-B) option. The FAA requests that owners and operators of any ADS-B IN (FIS-B) enabled aircraft and the owners and operators of Aspen EFD flight display notify the FAA contact listed below of any similar events. Owners and operators should be advised that service information from Aspen is forthcoming.